Beatersville 2014: What to wear? I'm so excited to be doing the Miss Beatersville contest, again, this year and to have a friend to go with me! I hope to do more events this summer :) That being said not only am I attending the Beatersville Car and Bike show (Sunday May 25th), but I'll be attending the pre-Beatersville BBQ Hootenanny and the Rev Up! before the show (two events in one day!). 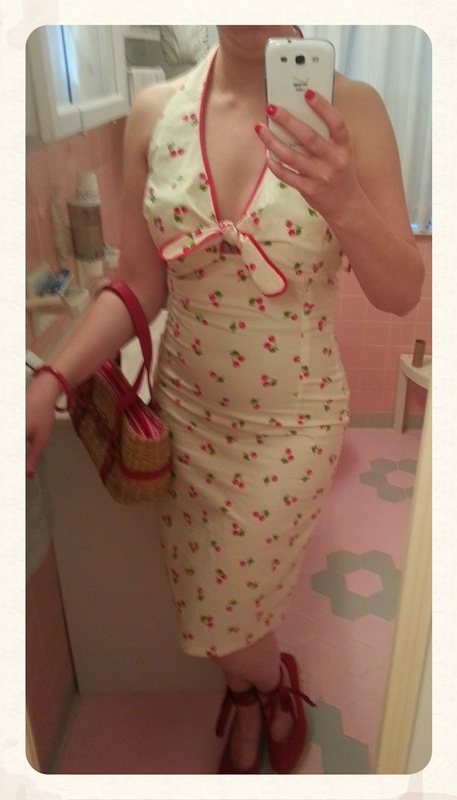 A few years ago I went out in search of a perfect Beatersville outfit and came across a lovely vintage circle skirt. It needed the perfect black top (which I have yet to purchase) as well as the perfect necklace. I finally acquired the necklace and can't wait to wear this ensemble. It's definitely in the top 5 of options to wear. Picture it with the Gigi top in black. At the same time I purchased the blue skirt I came across another vintage circle skirt and had to have that one as well. That skirt had the same predicament as the blue skirt - it needed the perfect top and necklace as well as shoes and a purse. I have finally collected almost all the necessities for this outfit as well. Even though I love the Gigi top in white I think the lines of the Marilyn top accentuate the outfit better. Rummaging through my closet I came across two more possibilities which could work for either event, though it bring up the debate: dressy or casual?